This tree is usually found in woodland areas particularly the moister areas. 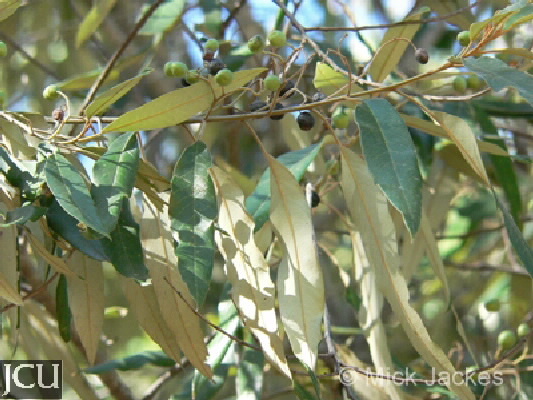 The alternate leaves are lanceolate to elliptical, whitish on the lower surface with prominent veins, in the dry season many leaves are shed and the remaining leaves hang vertically to reduce water loss. Freshly broken or scraped twigs produce a faint liniment odour. Saponins present, these are sometimes used as fish poisons. Flowers cream, the black fruit is more or less globular to 1 cm long.